TM Roofing and Building is an established roofing and building company based in Fleet, Hampshire who offers a full range of roofing and building services to homeowners and businesses in Hampshire, Surrey, Berkshire and surrounding counties. TM Roofing & Building's customers can expect the highest standards of craftsmanship on every roofing and building project, whether building a new home extension, converting a loft or garage, refurbishing a roof or undertaking roof alterations or roof repairs. TM Roofing & Building offer a truly comprehensive service, helping customers through every step of their roofing or building project, making the whole process seamless. To put it simply, they have all the tradesmen, knowledge and experience you will require under one roof - so from the initial concept, to design, plan submissions and on to realising your dream extension, conversion or new build project, TM Roofing and Building can do it all. This is an option, of course, but should you decide to use the 'Complete Project Service', then TM Roofing & Building will guide you through every stage, whilst providing expertise and advice from their team of qualified and highly experienced tradesmen along the way. Attention to detail and scrupulous principle supervision. TM Roofing and Building provides a full range of roofing and construction services, without sacrificing personal attention to each job. Clear client communication. Clear and frequent communication is vital to completing a project on time and in budget. Quality people and quality materials. We work with a hand-picked team of employees and subcontractors whose standards complement our own. TM's selection of materials is always based on long-lasting value. 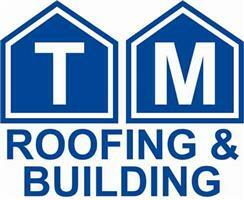 TM Roofing & Building have a substantial portfolio in all aspects of roofing and building works, backed up by hundreds of delighted customers; this is what makes TM Roofing and Building one of the leading Roofing and Building companies in the South of England. The company started in 1994 as TM Roofing, but the demand for building work was such that Trevor Martin, founder, decided to expand the business to offer the full service of roofing and building works to home owners, developers and trade associates. TM Roofing and Building has developed an excellent reputation for quality craftsmanship and reliability. Trevor Martin has completed a development of 2, 3 and 4 bedroom houses in Medstead, Hampshire and is currently contracted on a major re-development of a Grade II listed building in Guildford, Surrey. The TM Roofing & Building workforce consist of 50 roofers and builders who are a strong, reliable and trustworthy team, with many years of experience in their chosen specialist area. The main office and yard in Church Crookham is manned by a dedicated and experienced team of professionals, who are the voices at the end of the telephone and the welcoming faces when you visit the yard. Providing excellent customer service is a main focus for the entire team and testimonials given by customers indicate that TM Roofing and Building are definitely on the right track.